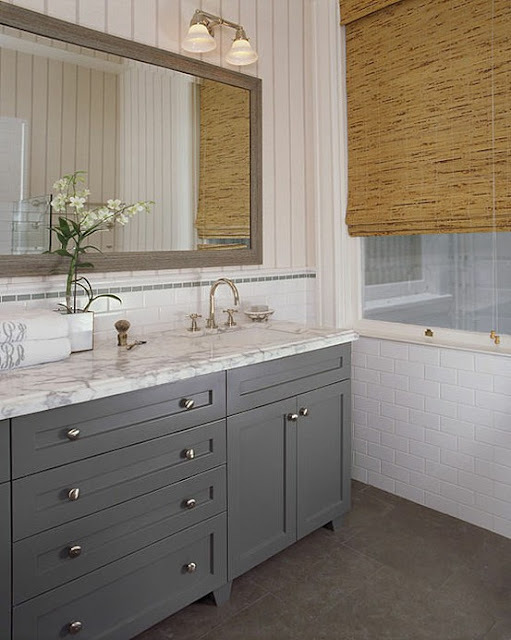 The Granite Gurus: FAQ Friday: How to use Carrara marble in a Masculine Bath? FAQ Friday: How to use Carrara marble in a Masculine Bath? "....I'm building a new home and I'm using Carrara marble everywhere. I'm doing this for a few different reasons. 1- I think it's a classic & neutral stone. 2- It's cheaper for me to use one stone on all of my countertops and since having it in my kitchen is a must, that means that I need to use the Carrara everywhere else as well. 3- I'm not scared of marble. In fact I really like the idea of having my home not look shiny and perfect forever. To me the etching, staining and scratches will add character to my home. My problem is I always think of Carrara as a feminine looking stone. I've had no problem designing my kitchen, master bath, girls baths, etc. I'm stuck on my boy's bath though. What colors and finishes would you recommend to make the Carrara look more masculine?....." Thanks for the question Jessica. I can see where you are coming from, but I think it should be fairly easy to make your boy's bath more masculine since the Carrara is so neutral. I would use blues, greens, greys or even browns. Dark wood cabinets or grey cabinets would add to the masculine feel. For your hardware & plumbing fixtures I'd use brushed nickel. This first bath they used green on the walls and with the tile shower. 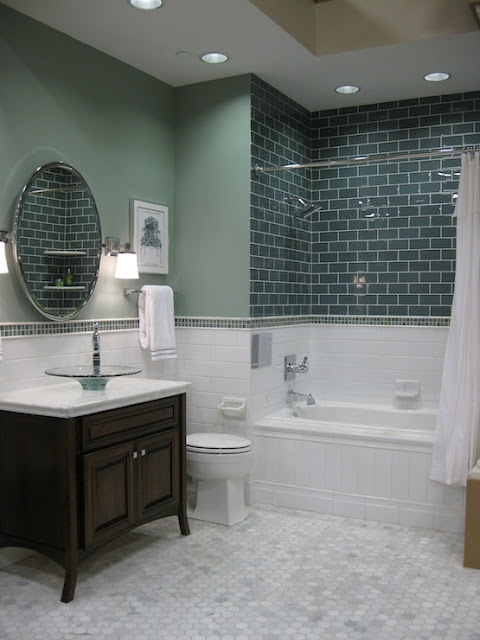 The white Carrara penny tiled floor, white Carrara countertop and white subway tile wainscoting keep this bathroom from looking too dark with the green and dark cabinet. We've got penny tile again in this next bath, this time in blue. 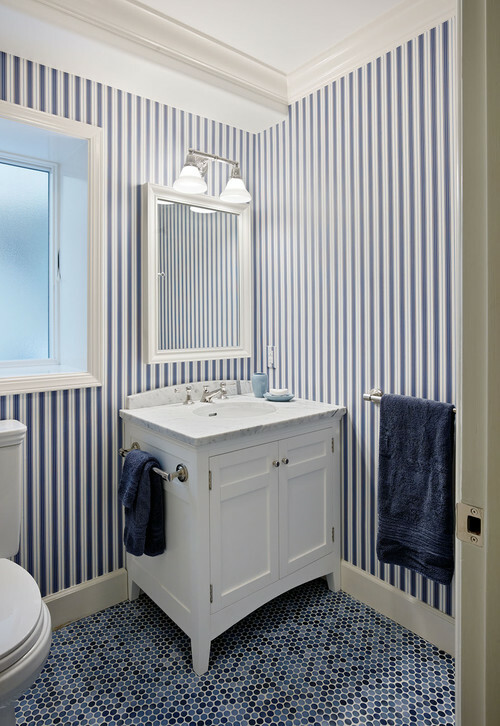 They have a white cabinet, but with the striped walls and blue floors I think this bath looks quite masculine and would be a really cute boy's bath. This bath isn't necessarily masculine or feminine, but this would be a great way to go as well. I really like the grey cabinets with the white marble countertop. The flooring is Lagos Azul limestone. 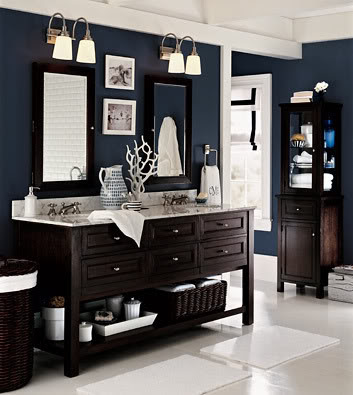 Last, if you want to go really dramatic, check out this navy blue bathroom. I think the dark walls with the white countertop and white flooring is a stunning look. Accessorize it a little differently and you'd have a great looking boy's bath. Hopefully this helps you see that there is definitely a way to use Carrara marble in a masculine room. Good luck with your new home! Thank you sooo much for these ideas! I can't believe you answered me with such a lovely post!!! I think I'm going to use that first, green bath as my inspiration. I like the navy too, but am worried it would be too dark because this bath doesn't have a lot of light. Anyway, thanks again! I love your blog and you've been so helpful.